What is Family Law and why is it different? Family Law covers all disputes involving relationship property, wills, trusts, and estates. These are all specialist areas of the law and require the appointment of appropriately skilled and qualified mediators. 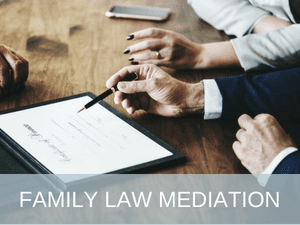 Our Family Law Mediators have demonstrated extensive knowledge, skill, and experience in Mediation as a process as well as the specific areas of law covered by our Family Law Mediation process. You can be assured that any Mediator appointed by FDR Centre has the requisite skills and experience to assist the parties to work through the matters at issue in an efficient and effective way, giving the parties the best chance of reaching a mutually satisfactory outcome. It is also essential that parties are represented by lawyers throughout the process when Family Law issues are concerned. This ensures that any agreement reached is valid and that the parties obtain the most efficient and effective outcome for their dispute. While arbitration is closely related to litigation, there are several key differences which make it an important and attractive alternative to litigation in the courts. Arbitration gives the parties the power to choose their own decision maker, the place and time of any hearing, and as far as they can agree, to control the arbitration procedures which may be varied to suit the nature and complexity of the dispute. 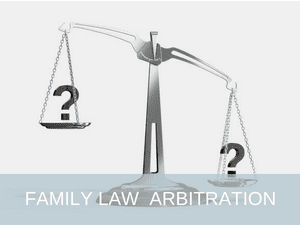 Importantly for family and relationship matters, arbitration is a private process and is confidential to the parties. The primary objective of modern arbitration is the fair, prompt, and cost effective determination of any dispute, in a manner that is proportionate to the amounts in dispute and the complexity of the issues involved. To ensure that objective is met in the context of Family Law Arbitration, the FDR Centre has developed a suite of Family Law Arbitration Rules that are robust and certain, yet innovative in their commonsense approach to challenging issues such as appointment, urgent interim relief, expedited procedures, summary procedures for early dismissal of claims and defences, joinder, consolidation, multiple contracts, confidentiality, representation, mediation, arbitral secretaries, expert evidence, appeals, and costs. Mediation is a consensual, confidential and relatively informal negotiation process in which parties to a dispute use the services of a skilled and independent mediator to assist them to define the issues in dispute, to develop and explore settlement options, to assess the implications of settlement options and to negotiate a mutually acceptable settlement of that dispute which meets their interests and needs. The objective of mediation is to enable and empower the parties to negotiate and resolve the dispute promptly, cost effectively and confidentially rather than to have a decision imposed upon them by a judge, arbitrator or adjudicator. The process enables the parties to negotiate flexible and creative solutions which need not conform to strict legal rights or general community standards. To meet those objectives, the FDR Centre has developed Family Law Mediation Rules to promote and encourage the negotiated settlement and early and cost effective resolution of relationship property and trusts, wills and estates disputes by mediation. The FDR Centre has also developed a Family Law Mediation Protocol to provide a guide to the rights and responsibilities of all participants in the mediation process under the Rules. 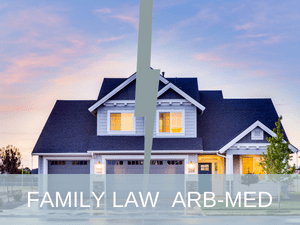 What is Family Law Arb-Med? Arb-Med is a hybrid process incorporating both arbitration and mediation processes. The advantage of this approach is that unlike a Settlement Agreement which must be enforced as a contract where there is a subsequent breach, an arbitrator’s award may be enforced by entry as a judgment in the High Court, or by action, and enforced in terms of the award. The process is relatively simple and straightforward. If following the mediation a party withdraws its consent to the arbitrator who was acting as mediator continuing to hear and determine the dispute, a replacement arbitrator will be appointed by the FDR Centre. The primary advantages of Arb-Med are first, that the parties are required to mediate in the context of a formal arbitration process with its attendant costs and resourcing implications that will immediately resume if they are not successful, and second, that if a settlement is not reached in the mediation, the arbitrator who was acting as mediator will have been informed as to the issues in dispute and the facts of the case which can be carried over into the arbitration with potentially significant time and cost savings for the parties. It is conceivable that the resumed arbitration may involve nothing further than the arbitrator making an award based on the evidence provided during the mediation. What are the advantages of using FDR Centre’s Family Law processes? Privacy: unlike the court system, FDR Centre’s Family Law service is completely private and confidential. This allows you to resolve your dispute without concern for undue public scrutiny. Dedicated case manager: a dedicated case manager will be appointed for your case. The case manager’s role is to administer the process and to act as the primary contact for both parties and the mediator. This ensures the process is run as smoothly as possible and avoids the need for you to repeat your story multiple times. Quality arbitrators and mediators: our arbitrators and mediators have demonstrated extensive knowledge, skill, and experience in mediation as a process as well as the specific areas of law covered by our Family Law processes. You can be assured that any arbitrator or mediator appointed by FDR Centre has the requisite skills and experience to assist you to work through the matters at issue in an efficient and effective way, giving the parties the best chance of reaching a mutually satisfactory outcome. Time and cost effective: the appointment of the arbitrator or mediator is typically completed within 24 hours of receipt of a completed application. With the mediation process, and depending on the parties’ availability, your mediation can be completed within a matter of days. The arbitration process may take as little as 45 working days. Our fees are set in proportion to the value of the dispute ensuring you receive the most cost effective process possible. Rules: FDR Centre has recognised and established procedural rules available to provide consistency and certainty for you and you advisors. Ongoing support: our case managers are there to answer all your questions and to support you throughout the process. They can also recommend additional services which may be relevant to your particular situation. We believe every case that comes through us is unique and our case managers are there to ensure you get the right advice. Information: FDR Centre maintains a comprehensive website providing extensive information about the dispute resolution processes we offer.